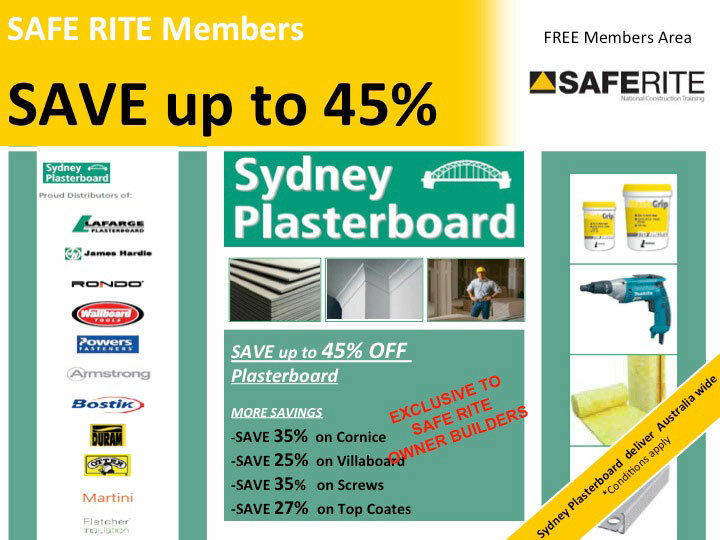 $$$avings - NSW Owner Builder Course Online - OHS White Card Courses - Saferite. 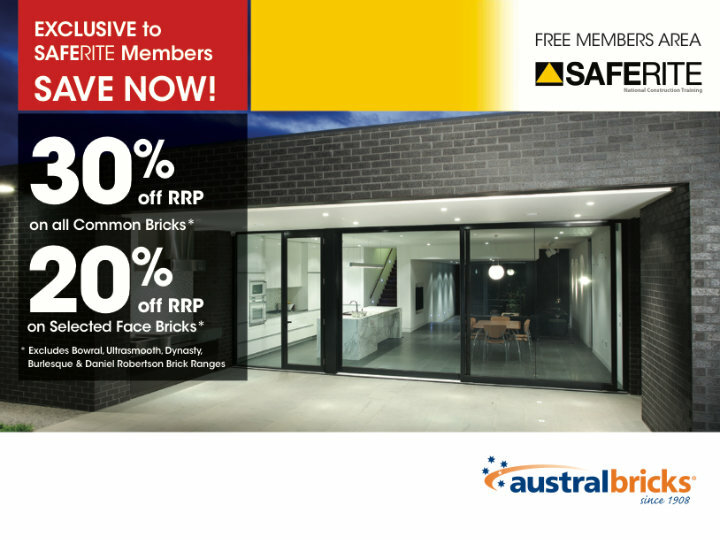 Exclusive to SAFE RITE Owner Builders Only. 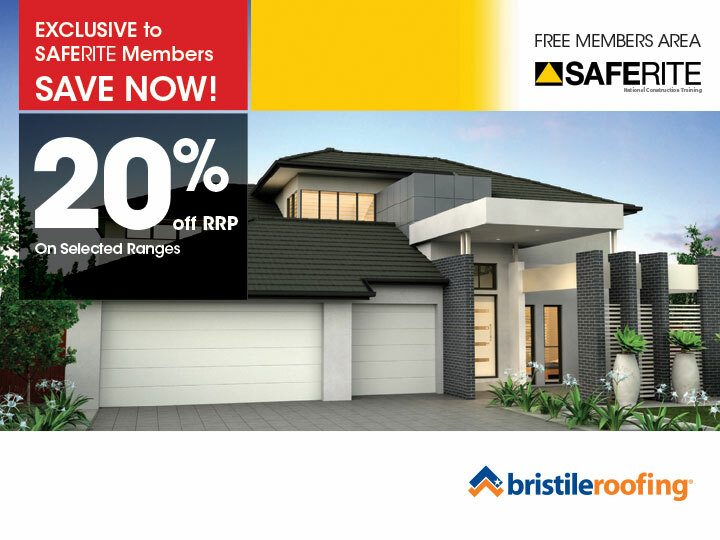 SAFE RITE is the ONLY owner builder course in Australia with the network in place to offer our owner builders EXCLUSIVE SAVINGS and INDUSTRY DISCOUNTS on the largest range of building materials, products and services. GUARANTEED! 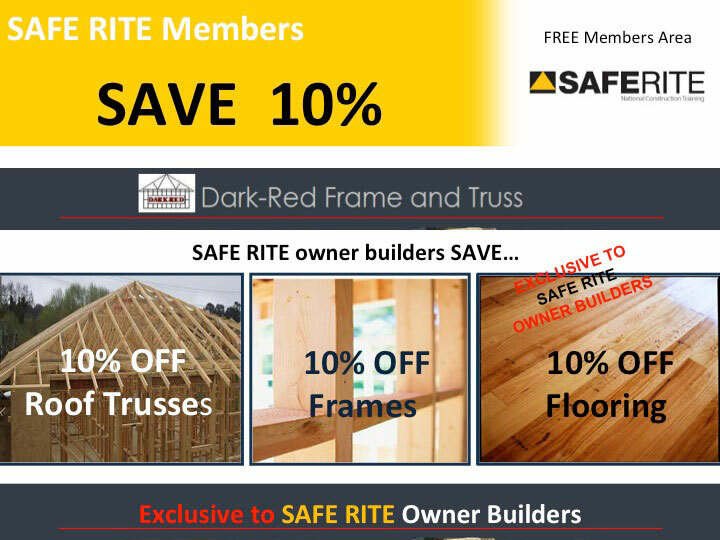 The SAFE RITE Owner Builder Members Area is an exclusive FREE service offered only to SAFE RITE Owner Builder Course participants. town planning, architects, legal, estimating software, WHS management plans, trades, plasterboard, bricks, roof tiles, roof trusses, frames, carpet & flooring, eco building materials, fencing, first aid equipment, even bedding and artwork for your interior design needs. 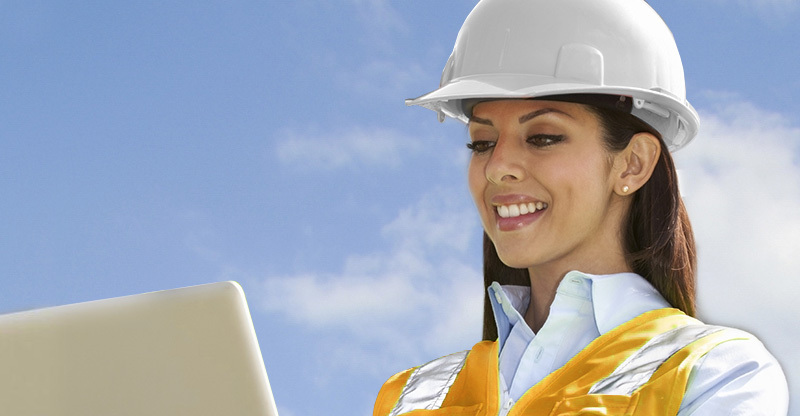 All your Owner Builder project needs at your finger tips. 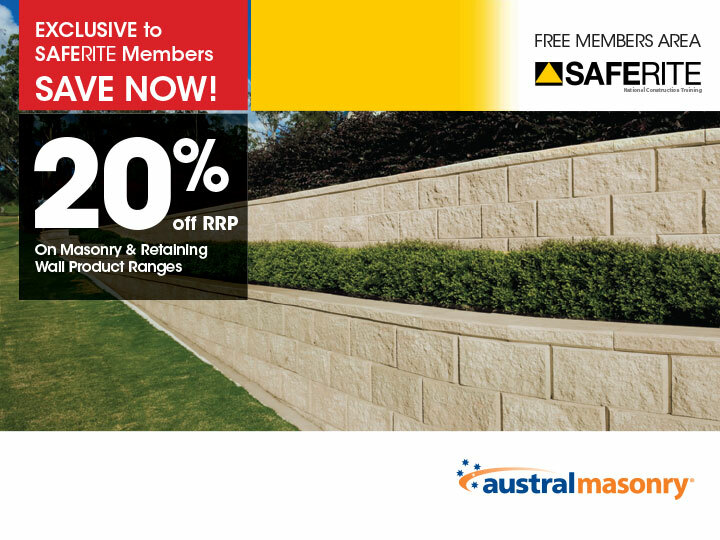 SAVE $10,000’s in genuine DISCOUNTS when you order your SAFE RITE Owner Builder Course. 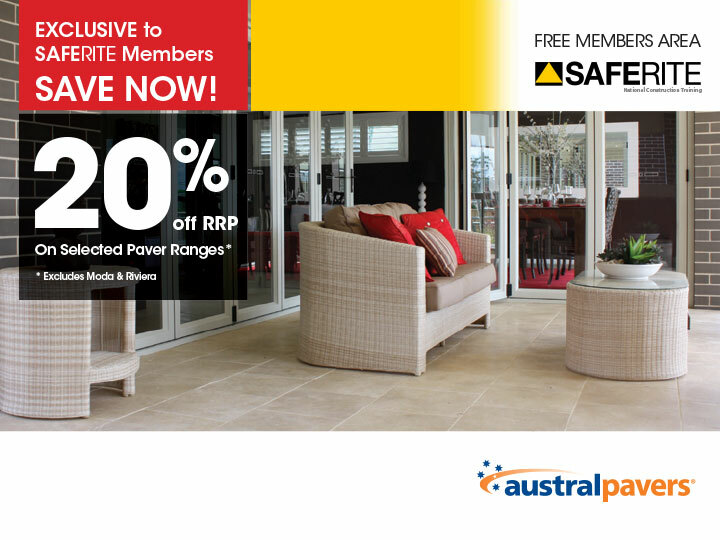 Become part of our exclusive Owner Builder Member’s club to receive the best discounts and deals on a range of building supplies, materials, services and home ware in Australia. MORE Savings , MORE Resources , MORE Features - GUARANTEED! 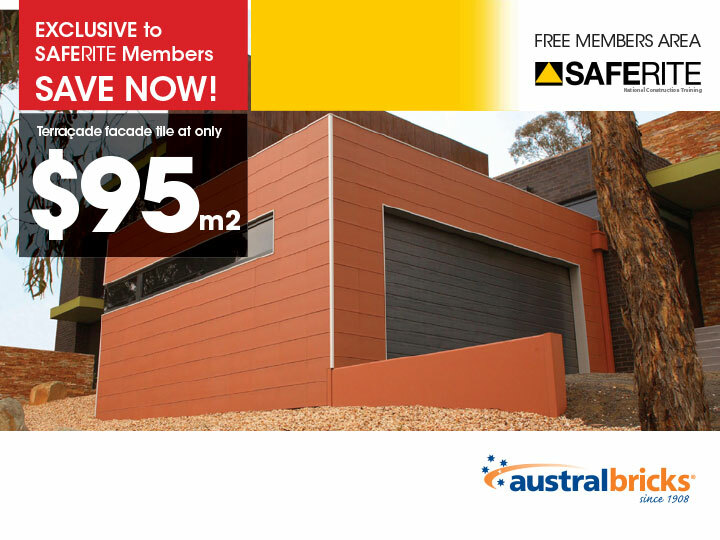 The GREATEST Owner Builder SAVINGS online! Become a QUALIFIED Owner Builder Today! 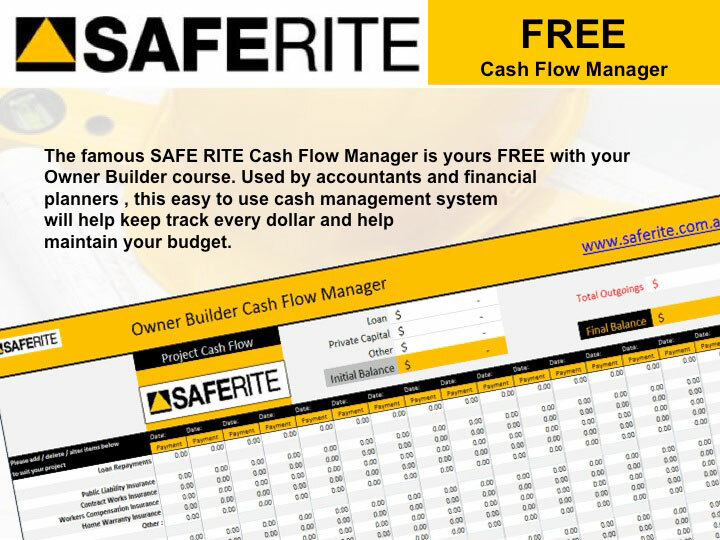 The famous SAFE RITE Owner Builder Cash Flow Manager is yours FREE with your Owner Builder course. Used by accountants and financial planners , this easy to use cash management system will help keep track every dollar and help maintain your budget. 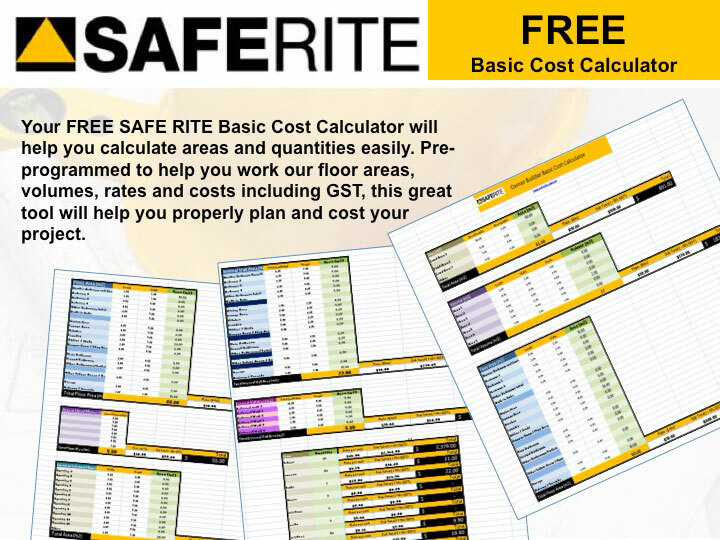 Your FREE SAFE RITE Owner Builder Basic Cost Calculator will help you calculate areas and quantities easily. Pre-programmed to help you work our floor areas, volumes, rates and costs including GST, this great tool will help you properly plan and cost your project. A must for any owner builder. 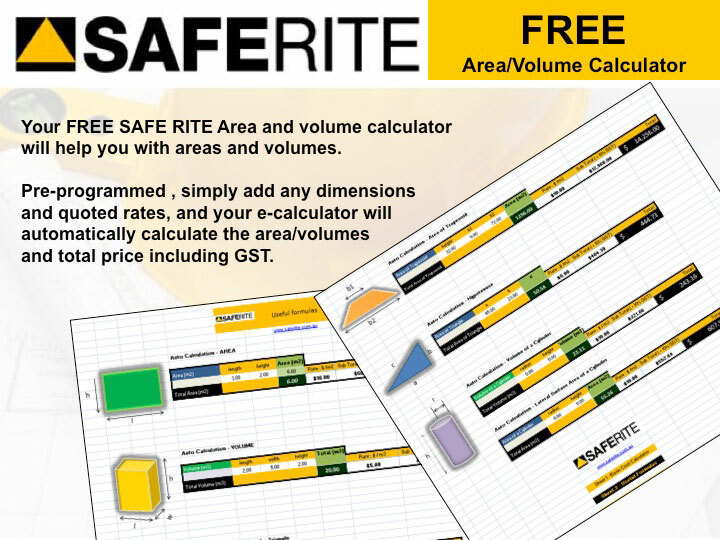 Your FREE SAFE RITE Owner Builder Area and volume calculator will help you with areas and volumes. Pre-programmed , simply add any dimensions and quoted rates, and your e-calculator will automatically calculate the area/volumes and total price including GST. 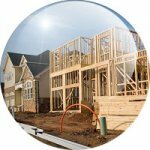 An easy to use tool for all your owner builder costings. 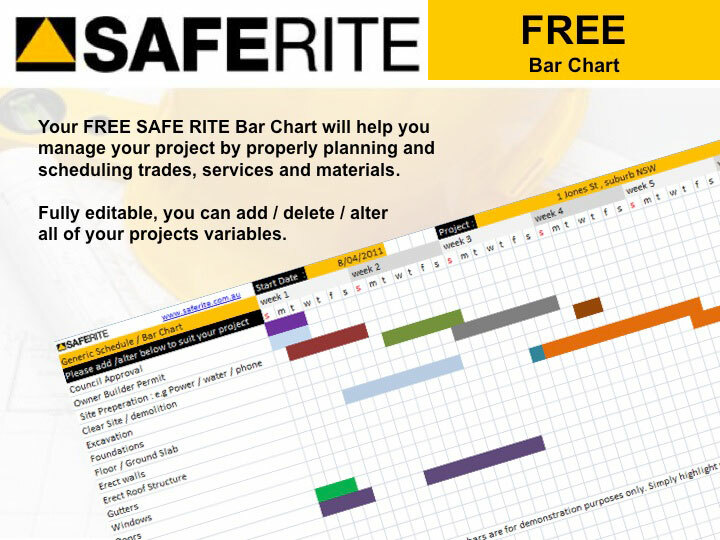 Your FREE SAFE RITE Bar Chart will help you manage your owner builder project by properly planning and scheduling trades, services and materials. Fully editable, you can add / delete / alter all of your projects variables. FREE Safe Work Method Statement (SWMS) Generator. 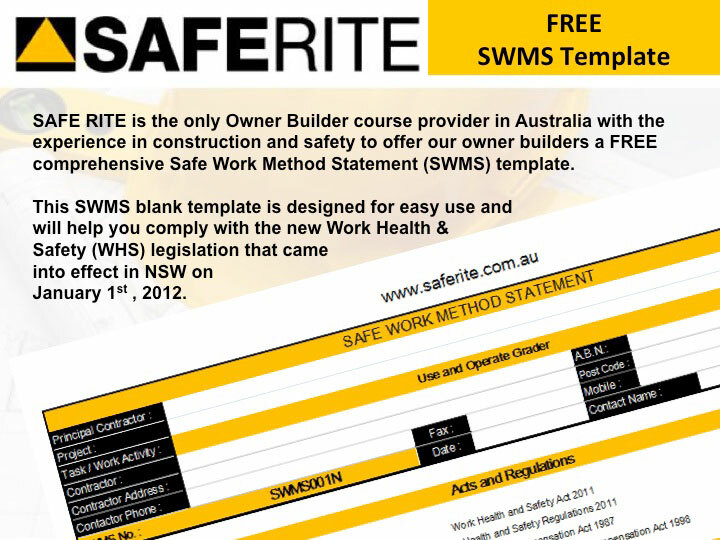 SAFE RITE is the only Owner Builder course provider in Australia with the experience in construction and safety to offer our Owner Builder Members a FREE comprehensive Safe Work Method Statement (SWMS) template. 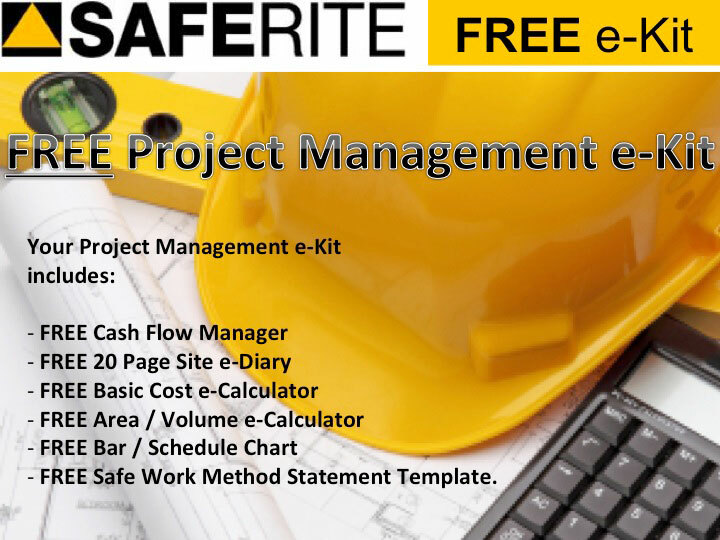 As part of your total FREE project management e-Kit, SAFE RITE has included contract templates for jobs up to $5,000 and for larger work over $5,000. Contracts for jobs greater than $1,000 are required by law. 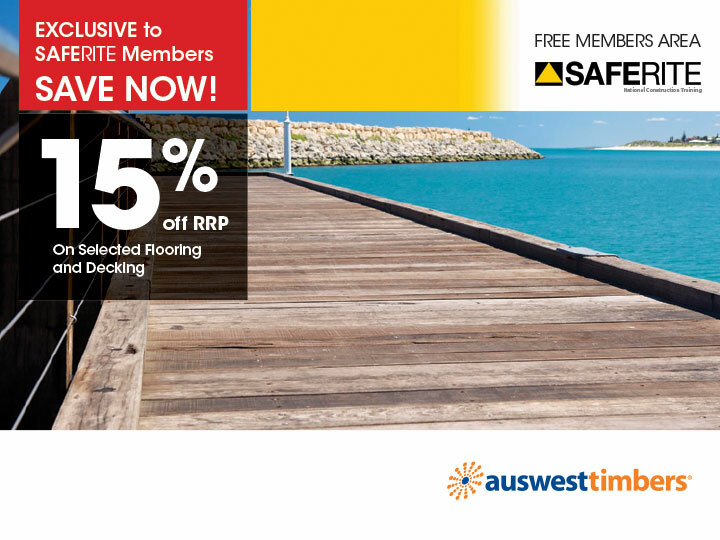 These contract templates are NSW Fair Trading approved. 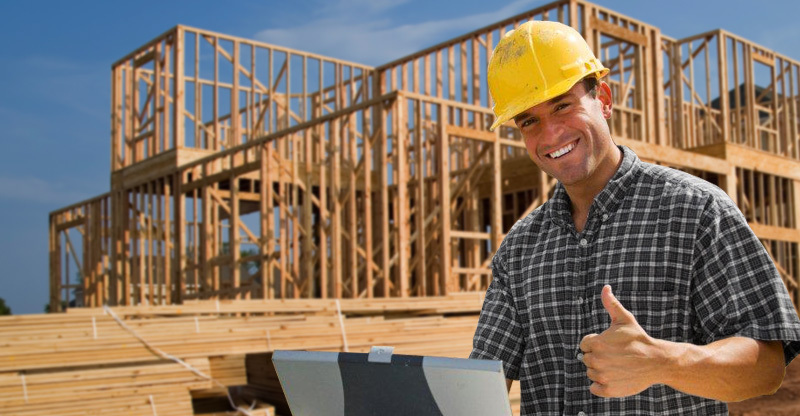 Become a CERTIFIED Owner Builder TODAY! 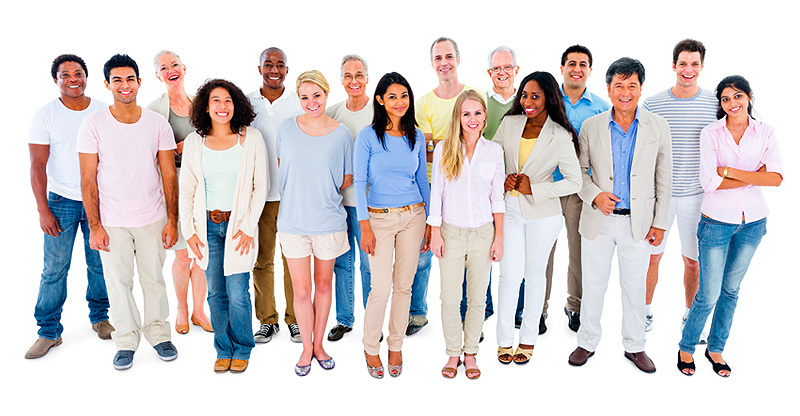 - Order Your Owner Builder Course NOW! 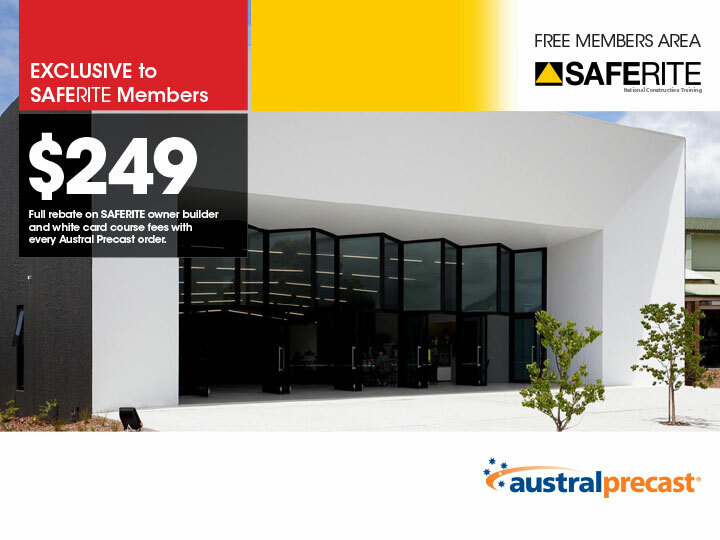 SAFE RITE is currently in the process of producing Australia's premier owner builder, safety, educational and DIY videos. 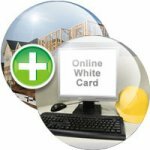 With a greater scope than anything currently on the market, the SAFE RITE Online Training Video series will be an instrumental learning tool to help owner builders, builders, contractors, sub contractors, tradespeople, workers and students develop and understand the fundamental concepts of successful building , construction and safety. 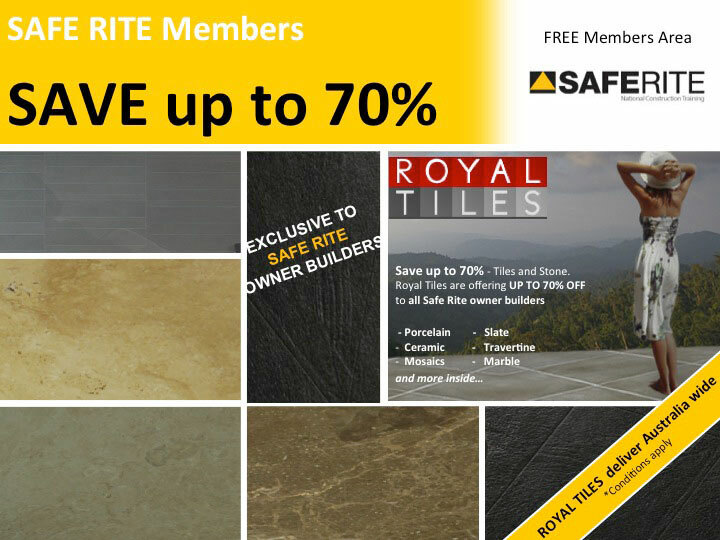 Until completion, SAFE RITE has partnered with leading names to offer a huge range of quality informative , educational and DIY videos. Access Your Owner Builder Course - NOW! 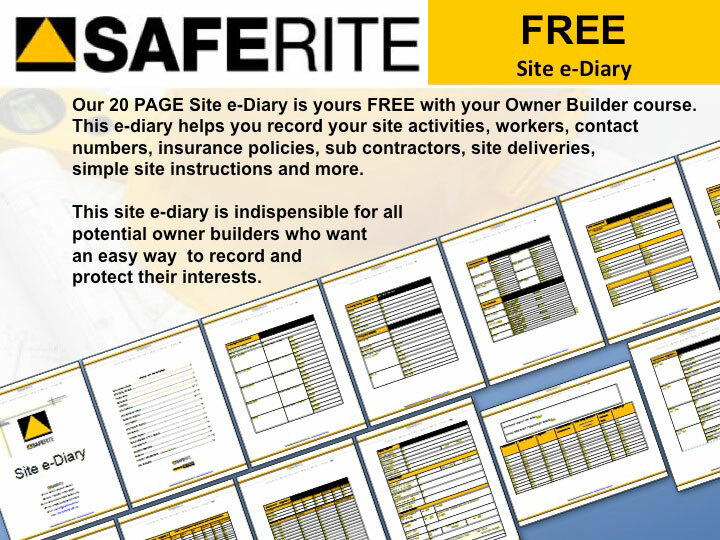 FREE Online Safe Work Method Statements. Required under the Work Health & Safety (WHS) Act 2011 for all high risk work. Become a CERTIFIED Owner Builder Today! 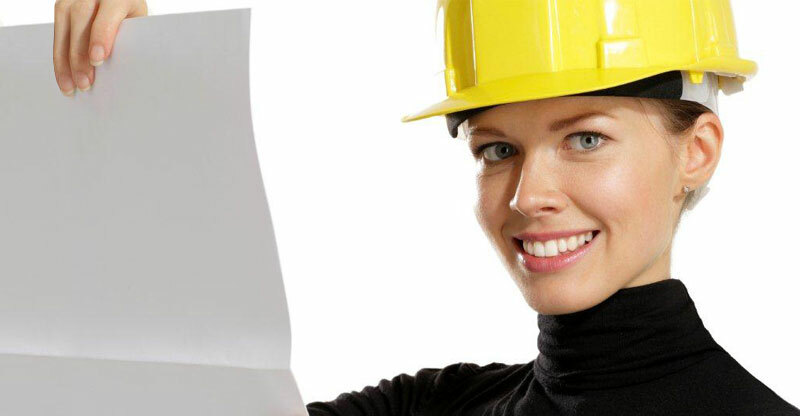 FREE Work Health & Safety (WHS) Management Plan and Construction Safety Plans - Required under the Work Health & Safety (WHS) Act 2011. 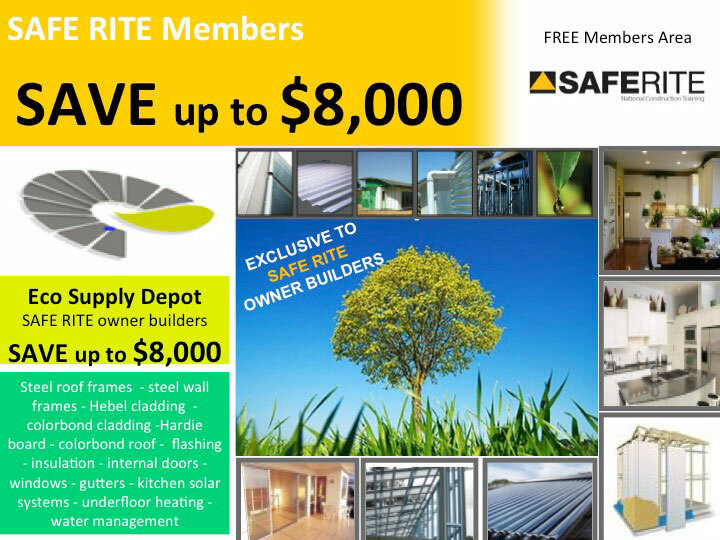 SAFE RITE Members SAVE up to $900 on commercial prices. 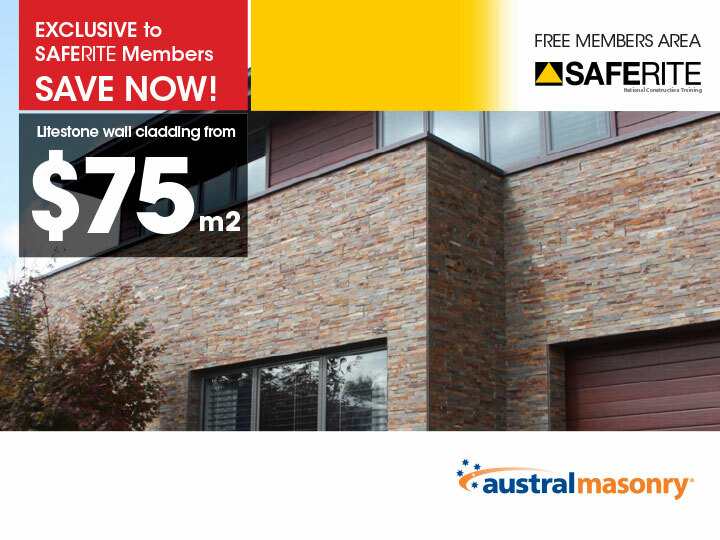 The MOST Comprehensive WHS Management Plan for Owner Builders in Australia. 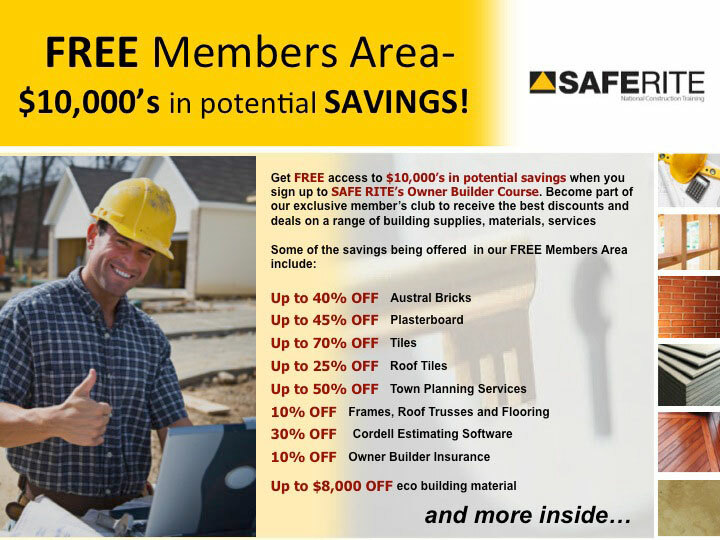 Yours FREE - SAVE $900! Order NOw! SAVE $100'S MORE ON ALL YOUR INSURANCE NEEDS. 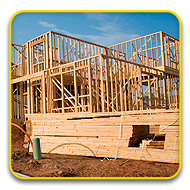 Owner Builder Course - Order NOW! Arrange a visit at a time and place of your choice.